Merrill Garbus, the creative force behind musical act Tune-Yards, has never been one to shy away from speaking up about topics she cares about. (Though we’re still awfully partial to that time she made fun of Justin Bieber, Diplo, and Skrillex.) But now, fans have a chance to hear the artist speak about some of the issues and ideas closest to her heart in a new 90-minute video from her appearance at the Red Bull Music Academy in Montreal last month, streaming exclusively at The A.V. Club. (You can find out more about the RBMA here.) It’s billed as a “lecture,” but really, it’s a revealing sit-down interview in which a series of prompts finds Garbus holding court on everything from vocal techniques from around the world, to the personal nature of political struggles and even the concept of equality, in ways both artistic and more broadly humanist. 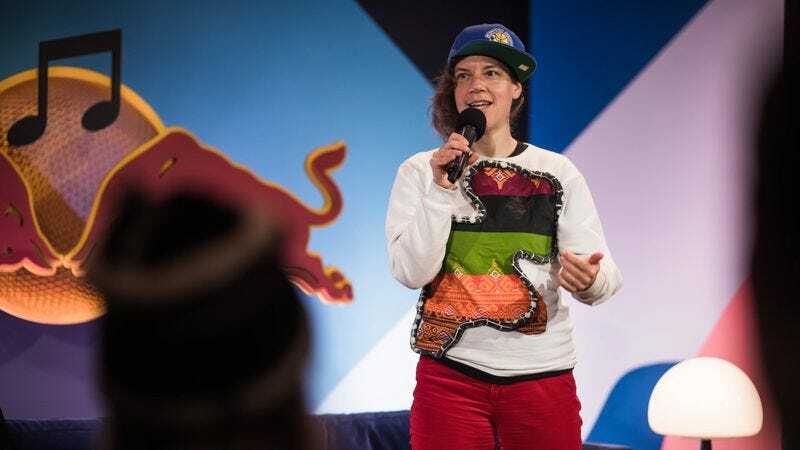 Additionally, the latest episode of Garbus’ monthly RBMA Radio show, “Tune-Yards presents C.L.A.W.” is also being released today, which you can check out below. C.L.A.W. is focused on showcasing new music by female-identifying artists, and in this latest installment, she has a roundtable discussion with Angel Deradoorian & Lucrecia Dalt. (You may recall we quite liked Deradoorian’s 2015 album, The Expanding Flower Planet.) The episode will be released at 6 p.m. ET, so you can either find it right here at that time, or check it out on the RBMA radio site.